The village at Roro is surrounded by hills of waste from asbestos mining and the dust from the waste continues to threaten the health of the community. Reported levels of lung cancers and other respiratory problems within the region are high. Planning for containment and safe disposal has been initiated by a stakeholders group, funded by Blacksmith institute. This stakeholders group, working with all key agencies, was the first effort initiated in this region to design a solution to this extensively contaminated area. Forgotten asbestos mine sickens Indian villagers, published by Katy Daigle, AP on Dec. 22, 2014 gives an update on the situation. About 20 kilometers west of Chaibasa, the headquarters of West Singhbhum district of Jharkhand, lies the Roro Hills– home to an abandoned chrysotile asbestos mine. The Roro mines were closed down in 1983 after Hyderabad Asbestos Cement Products Ltd. (now known as Hyderabad Industries Limited) decided that they were no longer profitable. Nearly 0.7 million tons of asbestos waste mixed with chromite-bearing host rock lies scattered here and in 20 years no study has been conducted to assess the fate of this hazardous waste dumped improperly on top of Roro hills. The waste material extends several meters down slope spreading into the paddy fields on the foothills of Roro. About 40 centimeters of thick silty waste of crushed rocks is spread over the paddy fields and poisoning the local residents. The preliminary health survey of 14 villages around the Roro hills, with 45% of the respondents being former workers of the Roro asbestos mines, indicates a highly probable link between the asbestos exposures and several adverse health effects, such as low back pain, dyspnea (shortness of breath and difficulty breathing), hemoptysis (blood in the sputum), and blindness. Old local newspaper clippings from Singbhumi Ekta, a weekly from Chaibasa, published between January and August 1981, include a press release from the late P. Mazumdar, the leader of the United Mine Workers Union (AITUC), which says that 30 workers from Roro mines had died of asbestosis. The fact-finding team’s interview with ex-workers from the Roro mines from Roro and Tilaisud villages revealed that most of them had suffered or are suffering from low back pains, blindness or severely reduced vision, and respiratory illnesses. Several of those interviewed complained of coughing blood in sputum. The team examined three chest radiographs (taken between 1998 and 2000) of workers who complained of chest pain and respiratory distress. The chest radiographs revealed several radio-opaque opacities in the middle and lower lobes of both lungs. These suggest some form of interstitial lung disease (pneumoconiosis, pulmonary tuberculosis as co- morbid conditions). Physical examinations were not carried out. Most patients described their conditions as tuberculosis but given their occupational histories, pneumoconiosis as either the principal diagnosis or a co-morbid condition cannot be ruled out and merits further investigation. Several workers with history of working in the asbestos mines complained of low back pain. One worker, who had worked at the pumping station for over 10 years, was suffering from epigastria hernia (A hernia is a protrusion of an organ or tissue through an abnormal opening in the body). These findings suggest presence of ergonomic musculo-skeletal disorders. Asbestos contamination threatening the lives of this remote community is under planning for containment and safe disposal by a stakeholders group initiated and funded by Blacksmith institute. 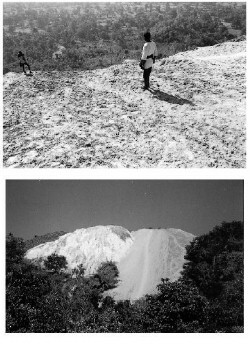 The hills around Roro are literally covered with asbestos dumped from extinct industry, and children play soccer and toboggan amongst the white landscape. Needless to say, lung cancers and other respiratory problems within the region are sky high. This stakeholders group, working with all key agencies, is the first effort initiated in this region to design a solution to this extensively contaminated area.